One of the things I've grown to miss about Orlando is our membership in the local food cooperative. While we're closer to CSA's than we've ever been, we didn't get here until after the start of the season and so haven't had an opportunity to take part. The nearest food co-op is outside the city, in Hillsborough or Chapel Hill, and that's unsustainable considering my current mode of transportation. All that to say, we've become spoiled by the Durham farmer's market, our most reliable source of locally grown fare. There's so much in season right now, we never have to try anything new because of the abundance of local veg we already love. The mystery box of produce we'd get from the co-op back in Florida, even with its peculiar, self-peeling "fruit" and occasional off-putting melons, broadened our palettes and forced us to consume copious amounts of greens and vegetables we would have otherwise avoided entirely. All of this was top of mind for me during our visit to the market early yesterday morning. A storm had come through the night before, which made for a smaller-than-usual crowd, but also knocked out power at our favorite Saturday morning bakery. No crostatas this week? Horrors. I wanted to get out of my comfort zone to be sure, but not before my morning coffee. (Cue violin music). 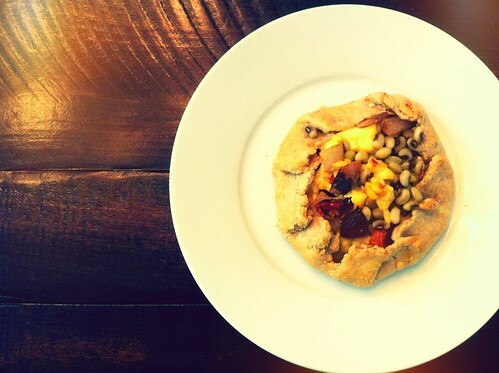 Scratch has been making a sweet cherry tomato and farmer's cheese crostata lately. It's the kind of pastry that invades your dreams and forces you to get up early enough to grab one before they're all gone. (Clearly I've fallen off the gluten-free bandwagon). I wasn't about to let a power outage stop me from having a crostata before the day's end. As we wandered from booth to booth, I picked up everything I'd need to recreate them at home, with the addition of a little something extra: purple hull peas. I remember eating copious amounts of purple hull peas growing up, simmered simply with bacon, but never fresh, and certainly never purchased right from the farmer who picked and shelled them. If you're lucky enough to have some of these ingredients nearby, go for it! If not, feel free to mix and match whatever beans, vegetables, or cheese you might be able to grab at your local market. This is a tart that could be made year-round with whatever veg is in season. Treat yourself to one with a simple salad for an over-the-top lunch, or dish them up as appetizers at your next dinner party. Makes 4 single-serving tarts. First, make the tart dough. Preheat the oven to 425°F. In a medium bowl, combine flour, nutmeg, thyme, and salt. Grate the butter into the mixture. Gradually add the milk until the mixture can be shaped into a ball. Divide the dough into four equal pieces, cover with plastic wrap or a clean towel, and refrigerate until you're ready to roll out. 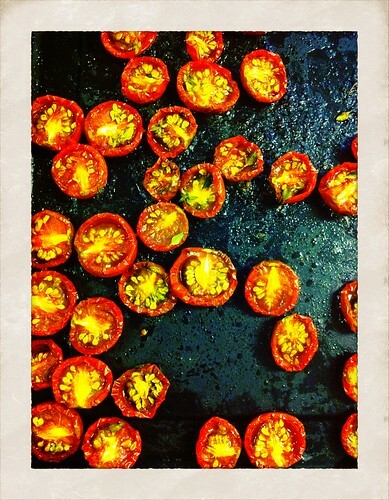 Toss the tomatoes and shallot with the olive oil; season to taste with salt and pepper. Spread the veggies in an even layer on a baking sheet, tomatoes cut sides up. Roast at 425° for 20 minutes, or until the skins are just beginning to blister and the shallot is softened. While the tomatoes roast, blanch the purple hull peas for 3-4 minutes in boiling water. Drain and rinse with cool water, and leave to drain until ready to use. When the vegetables are done roasting, turn the oven down to 400°. Chop the shallots and add them to a medium bowl with the tomatoes, purple hull peas, and farmer's cheese. Season to taste with salt and pepper; set aside. Remove the tart dough from the refrigerator and flour a cutting board and rolling pin well. Keeping the remaining dough pieces covered, flour and roll each piece into a circle about 1/8th of an inch thick. Work quickly, as the dough gets difficult to work with when the butter softens. 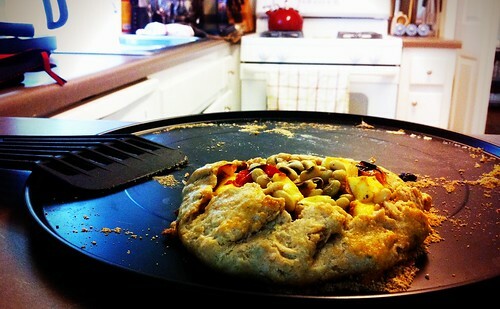 Sprinkle a pizza pan (or sheet pan) with some cornmeal or flour. Scoop 2-3 spoonfuls of the vegetable mixture in the middle of each tart round. Crimp the edges all the way around to keep the mixture perched in its place, and carefully move to the prepared pan. Beat the egg until the white has thoroughly combined with the yolk. Using a silicon basting brush, slather the folded pastry crust with the egg. Bake for 15 minutes, until the tart crusts are nice and crusty all around. Serve with a drizzle of good-quality extra-virgin olive oil on top, and a simple green salad on the side.